The best looking materials to make your home look good are often expensive. By substituting with concrete, you can actually achieve those same expensive looks without the high price! 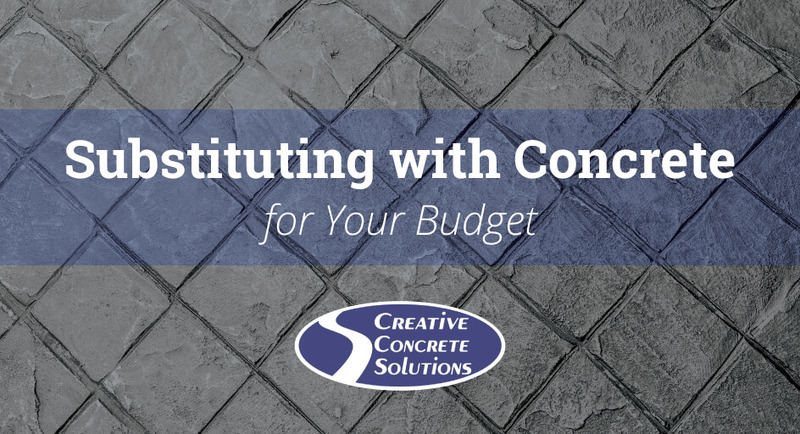 See for yourself how concrete can save you money by looking at these material cost comparisons. Don’t worry about sacrificing the appearance of your home because of a lower budget. Creative Concrete Solutions can replicate the expensive look you want to achieve at a lower cost without compromising on looks by substituting with concrete. Stamping concrete is creating a pattern or a texture to resemble more expensive materials such as wood, brick, tile, or natural stone. Stamping can even create imprint designs such as a logo for business floors or a family name in the driveway. Stamping involves adding a base and accent color to the concrete and then stamping a pattern into the color. These patterns last longer than the real product and look just as good as the real thing. The most common places to use concrete stamping is on outdoor patios and driveways. Concrete stain is a water-based product that coats the surface of concrete and melds into the material to become a permanent part of the concrete. With the proper sealant, stained concrete won’t fade or peel. Stains can replicate the look of marble (typically for countertops or floors) or natural stone (typically used for sidewalks, patios, or driveways). Now that you know concrete’s potential, the possibilities for your home are endless! You can have a “marble” countertop, “natural stone” sidewalk, “wooden” patio, and “brick” driveway all for the cost of concrete. And they will all increase your home’s resale value! With this in mind, what will your next home upgrade be? Contact us at Creative Concrete Solutions today by calling 615-691-6613 or by visiting our website. Let us know what you’re thinking of for your home, and we’ll work with you to provide a creative solution.